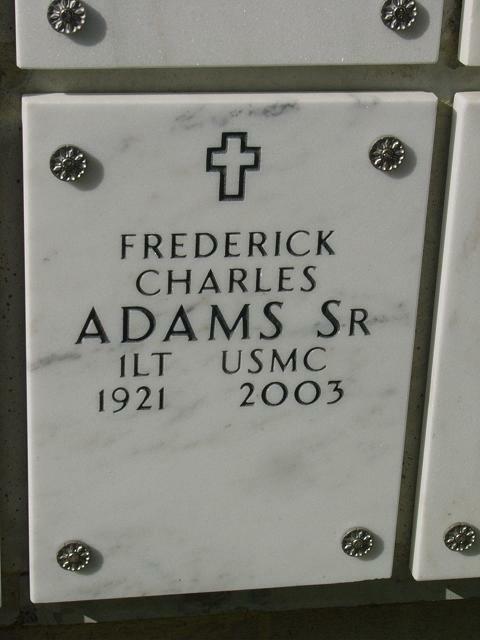 A celebration of life took place June 2, 2003, at Anacortes, Washington, for Dr. Frederick Charles Adams, who died May 17, 2003, at Anacortes. He was 81. Dr. Adams was born June 27, 1921, at Milwaukee, Wisconsin. He had a 38-year career in education as a teacher, coach and high school principal and administrator. He received his undergraduate degree from the University of Wisconsin-Lacrosse and his doctorate of education from the University of Oregon. He served in the Marine Corps during World War II as a first lieutenant and saw action in the Pacific theater. After the war, Dr. Adams moved from Wisconsin to Oregon and then to California, where he spend 30 of his 38 years in education. After 12 years as principal of Inglewood High School near Los Angeles, he worked in the district office of the San Mateo School District in the San Francisco Bay Area. He then served as principal of South Tahoe High School from 1969 to 1972 and concluded his career with a 12-year term (1972 to 1984) as principal of Chaffey High School near Los Angeles. He retired in 1984 and in 1996. He relocated to Oak Harbor, Washington, and then to Anacortes to be closer to his eldest son. Dr. Adams devoted his time and energy to serving the needs of his country. He took seriously the responsibility of providing a quality-learning environment for America's youth. He was also a loving husband and caring father who give the greatest gifts to his children in the form of high ethical and moral standards. In leading by example, he laid a strong foundation for his children to emulate in their adult lives. Dr. Adams is survived by his wife of 59 years, Barbara Ann Adams of Anacortes; daughter, Cathleen Adams of London, England; sons and daughters-in-law, Gary and Evelyn Adams of Anacortes; John and Jackie Adams of Zephyr Cove, Nev.; Fred Jr. and Kathy Adams of Sterling, Virginia; five grandchildren; and one great-grandchild. A celebration of life took place June 2 at Anacortes in accordance with his last wishes. Dr. Adams ashes will be interred July 28 at Arlington National Cemetery.